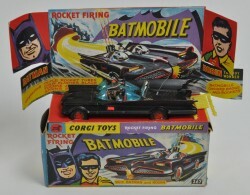 Interesting to know is, that in this and the following auction some nice die cast car models (Dinky, Corgy, Matchbox etc.) will be sold. Nice lots in September will without any doubt be the Batmobile and the James Bond Cars.